Orthodontic Retention: What? Why? How? When? Orthodontic retention is an important stage of any form of orthodontic treatment. The aim of the retention phase is to maintain the corrections in tooth position and bite that have been achieved during treatment. Why do we need to retain? Teeth have a natural tendency to want to return to their pre-treatment position because of elastic pull generated from the gum tissue. These forces of elastic recoil are particularly important during the first year after appliance removal. Following this the gum tissue will adapt to the corrected tooth positions. Certain tooth movements are more prone to relapse for example closure of spaces and correction of rotated (twisted) teeth. Teeth continue to move throughout our lifetime because of small amounts of facial growth which have been shown to occur up to our seventies. There are also age related changes in the soft tissues of the face which can alter the pressure placed onto our teeth and cause tooth movement. The lower incisors are particularly prone to crowding changes with ageing and this phenomenon has been termed late incisor crowding. It is generally accepted that continual lower jaw growth, and NOT eruption of wisdom teeth, is responsible for this change. Therefore, orthodontists no longer recommend removal of wisdom teeth for the sole purpose of preventing late incisor crowding. Many patients experience gum (periodontal) disease in life and the reduced support of the teeth also makes them more prone to tooth movement. How do we need to retain? Retainers can be fixed to the teeth or removable. A fixed retainer consists of a thin (approximately 1mm diameter) stainless steel wire that is bonded onto the back surfaces of the incisor teeth with tooth coloured cement. They are most commonly used behind the lower incisor teeth, however, can occasionally be used behind the upper incisor if the bite is not too deep. 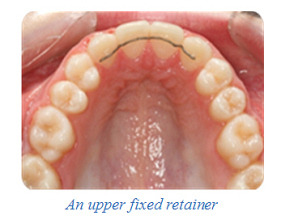 The main advantage of a fixed retainer is that its use is not dependent on the patient remembering to place it everyday. Disadvantages include that they do not allow flossing of the incisors, they can be difficult to clean and they require long–term professional maintenance which has cost implications. There are many types of removable retainer. These include acrylic retainers and clear retainers. An advantage of removable retainers include that they can be removed to clean the teeth. A disadvantage is that good compliance is required with retainer wear. All patients should be advised that they need to wear retainers following orthodontic treatment. If a removable retainer is placed it is advisable to wear the retainer at least every night for the first year after treatment. Following this the retainer can be worn a few nights per week. Retainers should be worn to some degree for as long as a guarantee is required for the teeth to remain straight. As previously outlined, teeth have a natural tendency to move throughout our lifes. Poor compliance with retainer wear will almost certainly result in some tooth movement towards the original tooth position which is known as relapse.